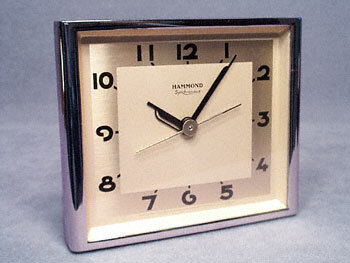 This is a 1930s Hammond Synchronous electric alarm clock. It is 5-1/4" wide and 4-1/2" tall, has a chrome bezel/frame, and black enameled back. The alarm setting dial (which actually has the time markings on it) and the on/off switch are on the back, along with the starting knob and time set. This clock has been rewired, runs very well, and is in truly immaculate condition.